It’s not often you see a good story come out of Iraq. Especially one focused on restoring an ecosystem and a way of life. But on the heels of a particularly bloody month in Iraq, the BBC is reporting just such a story. It is the story of the restoration of the marshlands of the Tigris-Euphrates. Some believe that these very marshlands were the inspiration for the Garden of Eden in both the Bible and Koran. Perhaps also the site of the biblical flood. Although they are in distant country better know for conflict, there loss would be a loss for all of us. I have only been to Baghdad once — about a month before the start of the first Gulf War in 1991. I had been stuck in Kuwait for months — forced into hiding with my father. Finally I was on my long way back to England. No doubt I had other things on my mind at the time as I flew over the marshes of the Tigris-Euphrates. At that time while the marshes had seen been disrupted due to irrigation projects, they were still the home to a number of Marsh Arab tribes opposed to the Baathist regime. That soon changed. Following a failed uprising after the first Gulf War, the regime started a systematic campaign to drain the marshes to eliminate the tribes food supply and places of refuge. Marsh draining is common-place around the world — often in order that “unproductive” marsh land can be brought into use as rich cropland. But this was different. This was designed to break a way of life that had gone on for millennia. The regime almost succeeded in destroying the marshes and wiping these people out. 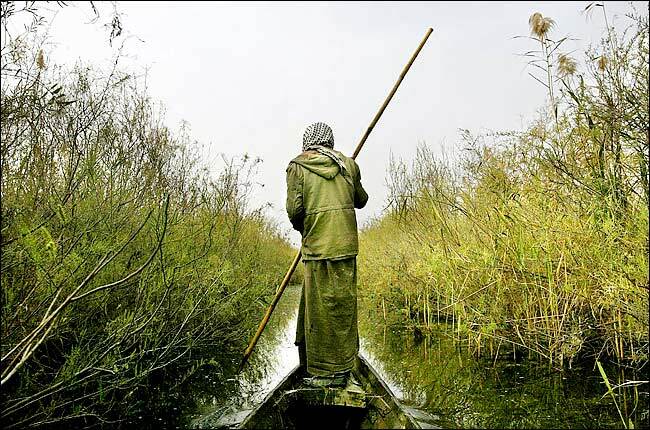 The population of marsh arabs dropped from 500,000 in the 1950s to fewer than 20,000. But now as part of the post-war recovery effort, the marshes are being flooded and a way of life is slowly starting to come back. It’s gratifying to read these positive stories. It is also a good reminder that restoring the Earth and its natural systems restores our connection to our past. In this case, just perhaps back to the mythical Garden of Eden. photos: James Gordon; Salim Virji. sourced from Flickr.